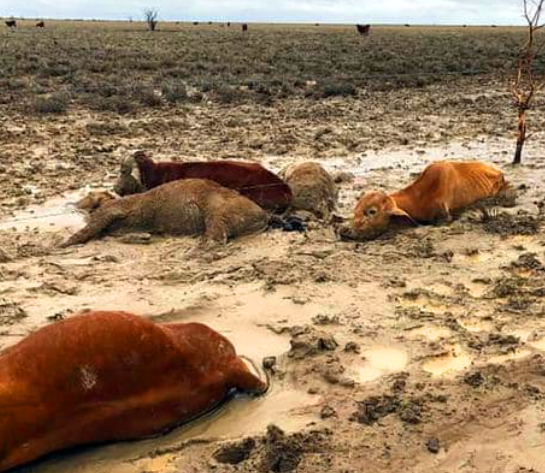 There are estimates that half a million cattle have been killed in Queensland flood waters. While the extent of the losses will not be known for weeks, the peak farming lobby has described the situation as “a massive humanitarian crisis”. After several years of drought, some rural parts of Queensland have received three years’ worth of rain in a week. AgForce CEO Michael Guerin says it could take decades to recover. “There is no doubt that this is a disaster of unprecedented proportion,” Mr Guerin said. “The speed and intensity of the unfolding tragedy makes it hard to believe that it’s just a week since farmers’ elation at receiving the first decent rains in five years turned to horror at the devastating and unprecedented flood that quickly followed. Some estimates of the losses are as high as 500,000 out of 10.5 million head of cattle in Queensland. “I implore governments of all levels, as well as other agencies involved in this mammoth undertaking, to put aside red tape, bureaucratic wrangling and patch protection, and understand the desperate situation of so many producers,” Mr Guerin said. “The loss of hundreds of thousands of cattle after five, six, seven years of drought is a debilitating blow not just to individual farmers, many of whom have lost literally everything, but to rural communities. “Some farmers have lost everything, literally everything, except an ever-growing debt, and our first priority is to make sure that they are OK,” he said. The Federal Government has offered immediate ex gratia payments of $1 million to affected shires. “This payment will be for them to use on priorities they deem most urgent, whether that be rate relief for impacted properties, infrastructure, or the disposal of cattle which have perished,” Prime Minister Scott Morrison said on Monday.